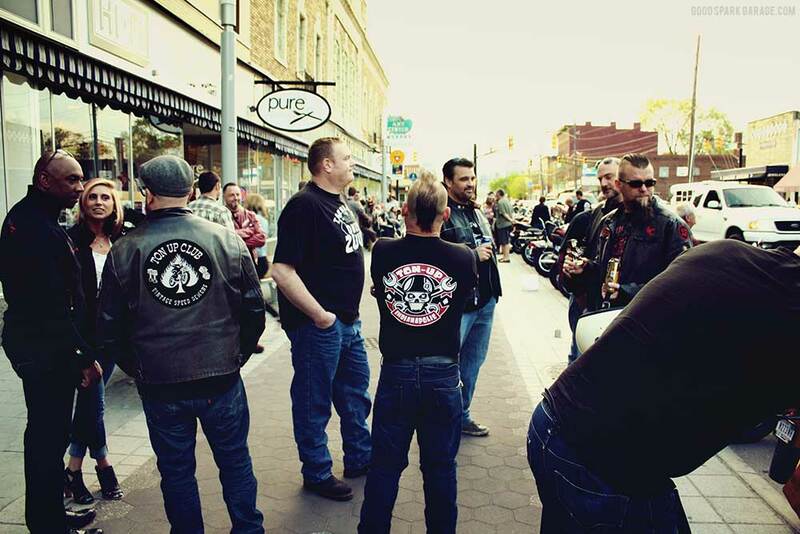 The annual Rockers Reunion Indianapolis is coming up, but before the main event, the Ton-Up Indy guys host a Trophy Unveiling as a preview party. 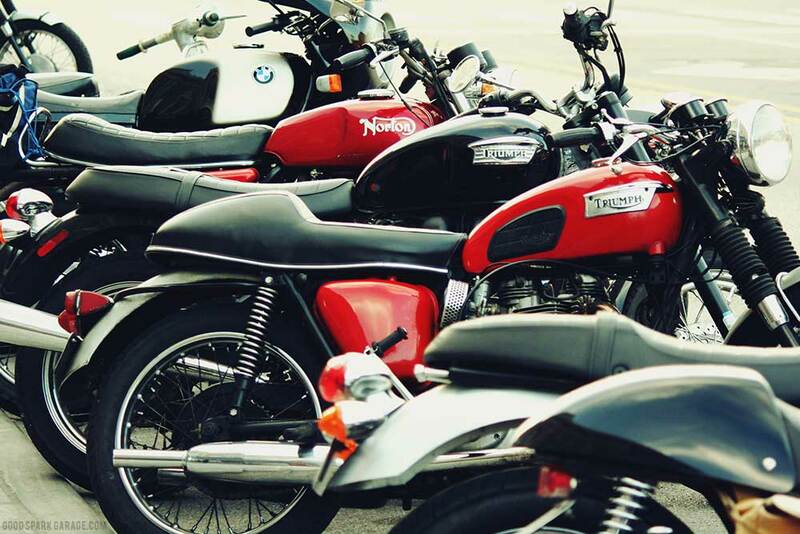 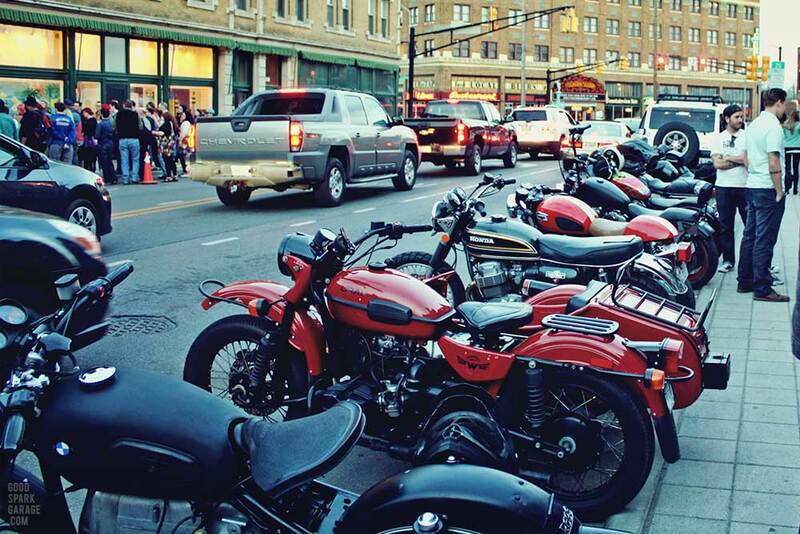 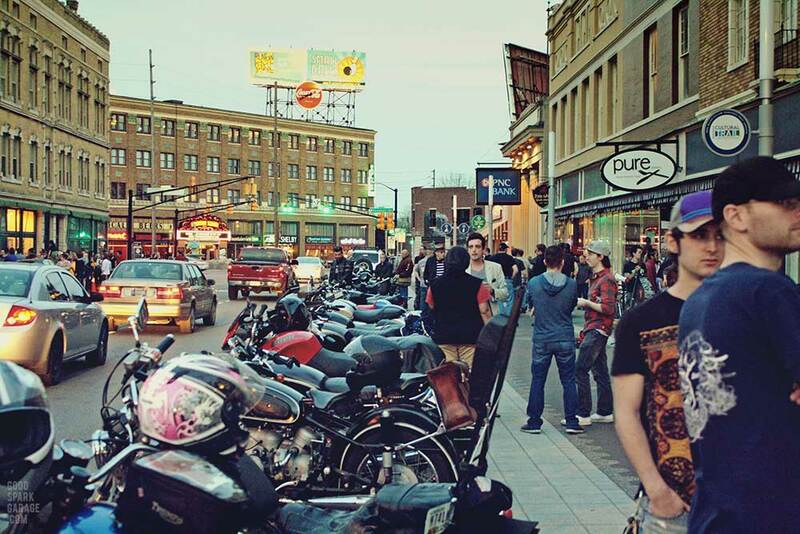 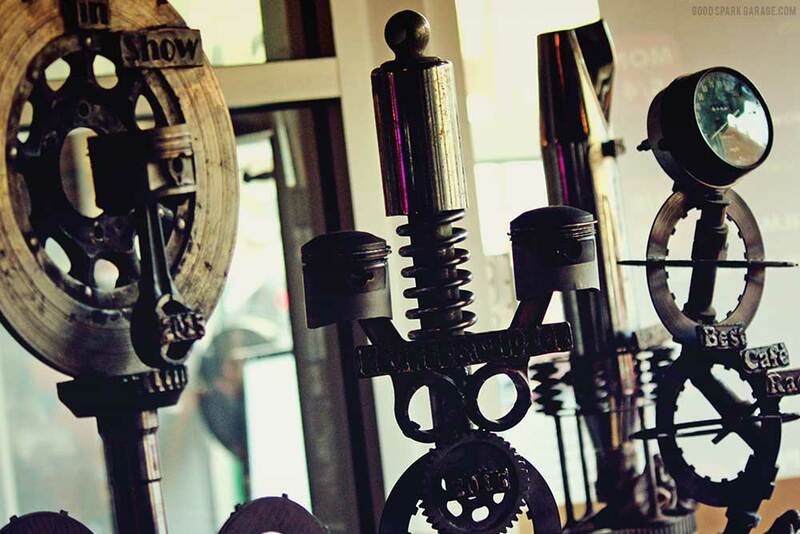 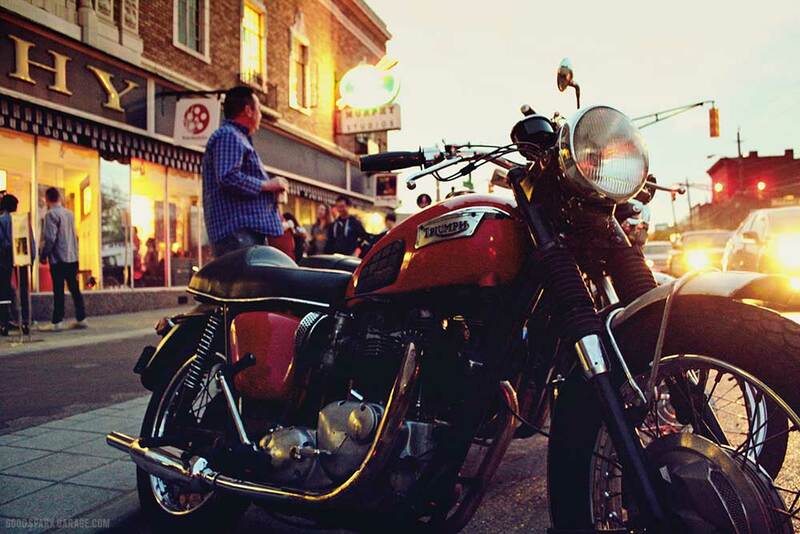 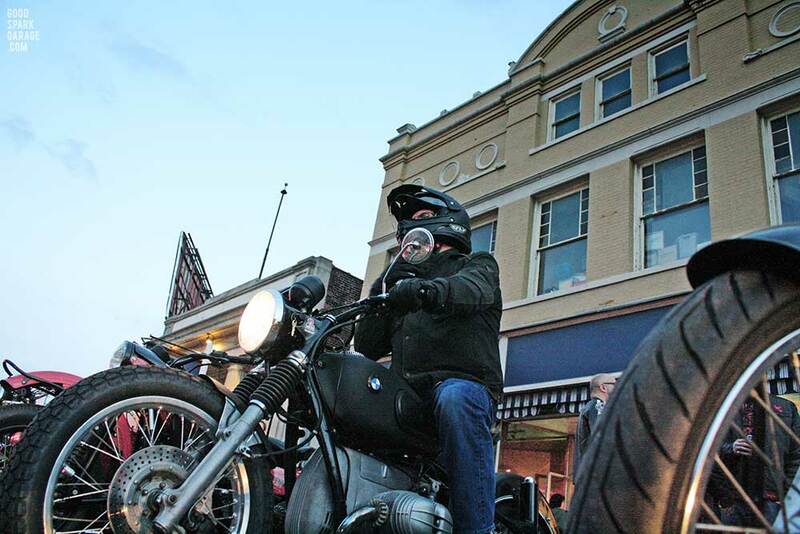 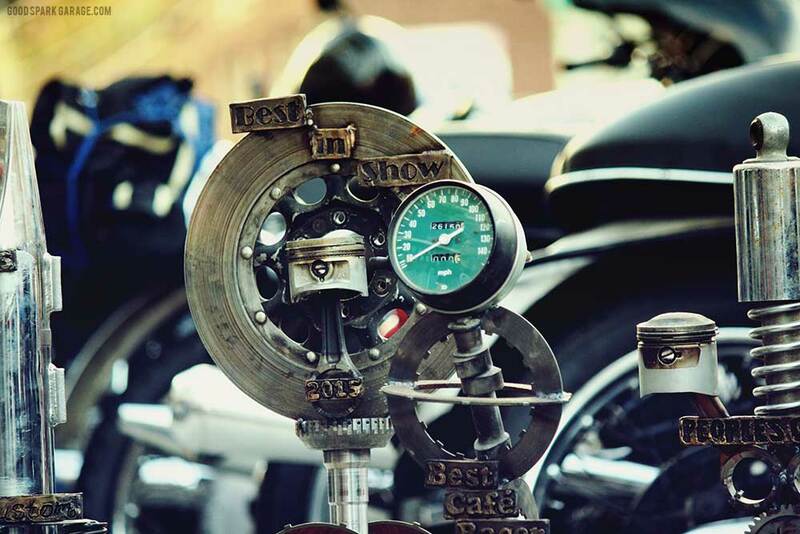 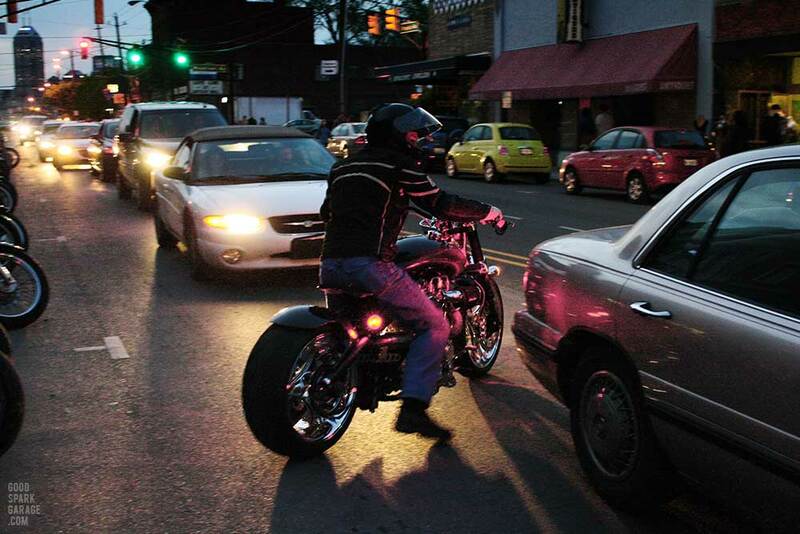 Here’s a taste of the scene in historic Fountain Square, featuring vintage motorcycles and custom trophies that will be given to bike show winners on May 30th, 2015. 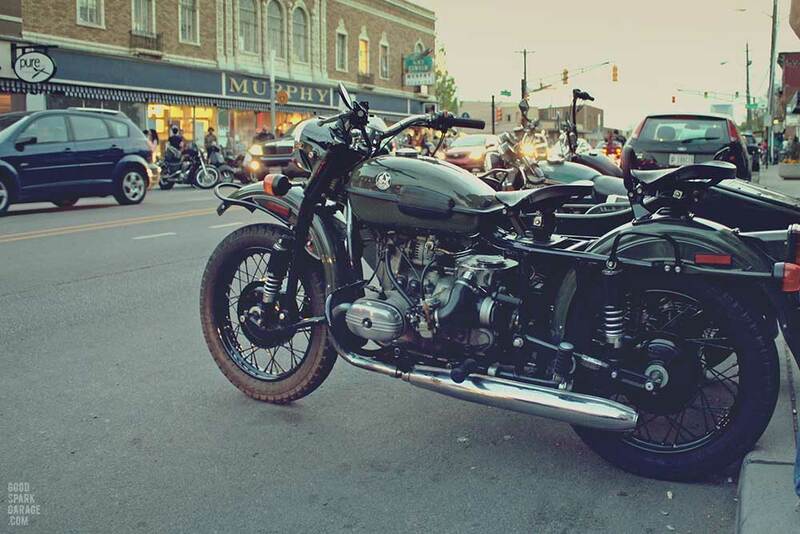 The Rockers Reunion Indy awards for the top tier categories are killer moto-sculptures made by Ton-Up Indy’s Sean Neal. 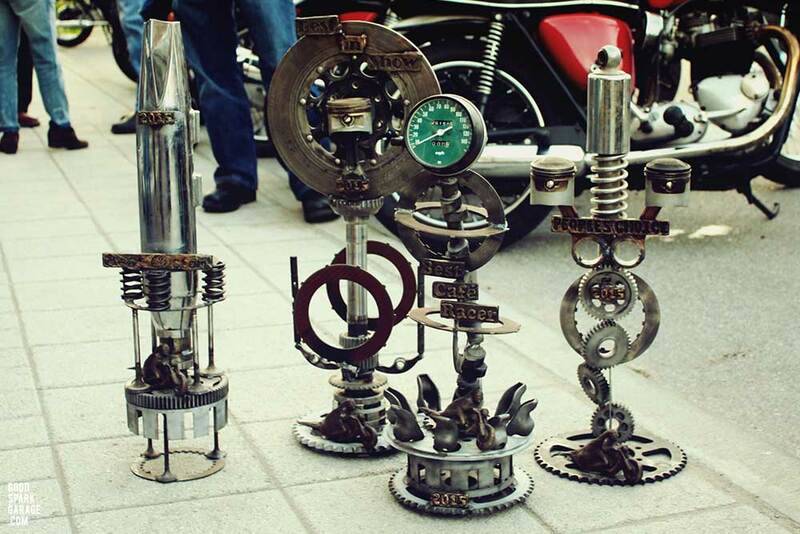 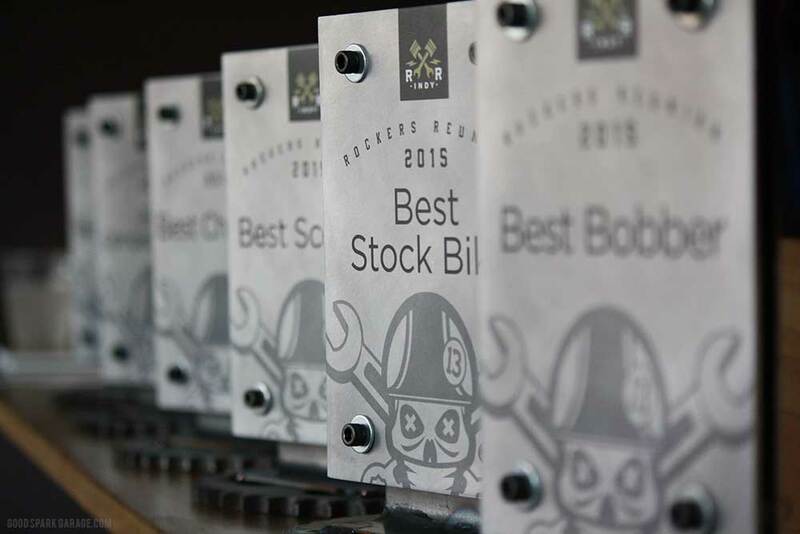 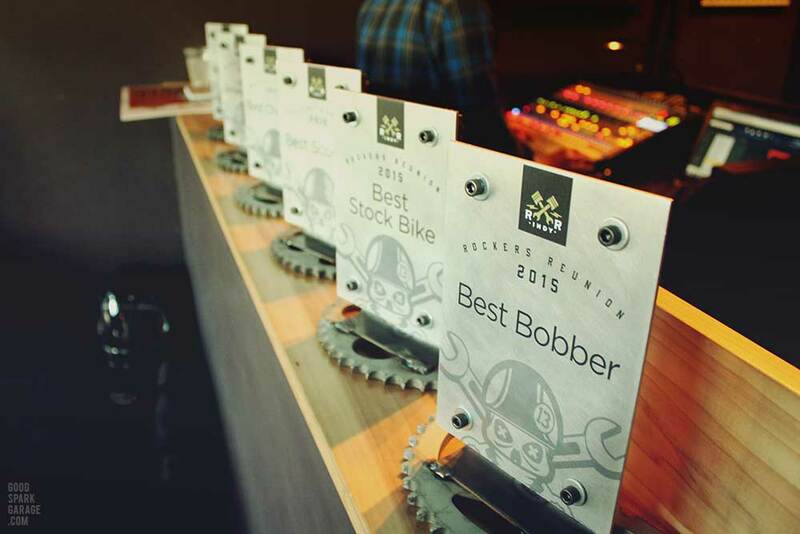 Another artist among the group, Adam Ratcliff, oversaw the design and creation of even more trophies (below) that motorcyclists will have a chance to win. 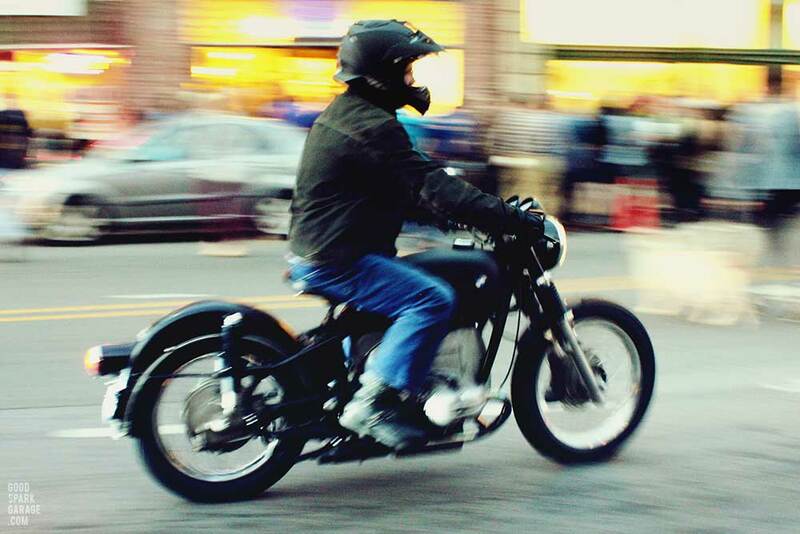 One half of Good Spark Garage, Casey Wilkinson rode in on a 2000 Patrol Ural sidecar motorcycle. 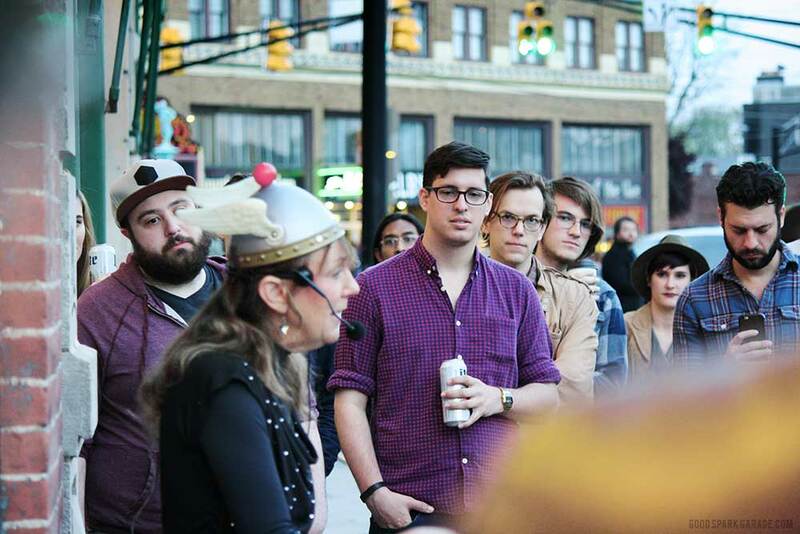 Looking toward the center of the Circle City from Fountain Square. 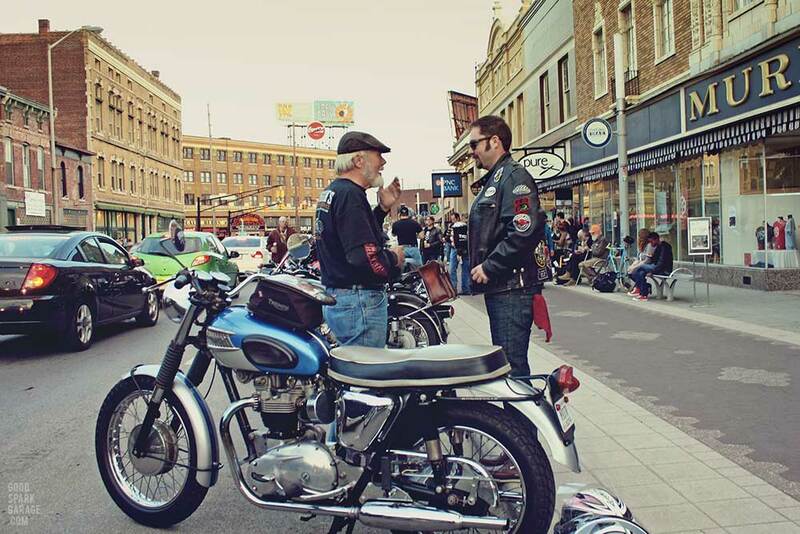 Tim and Chris Duggan, father and son vintage motorcycle enthusiasts. 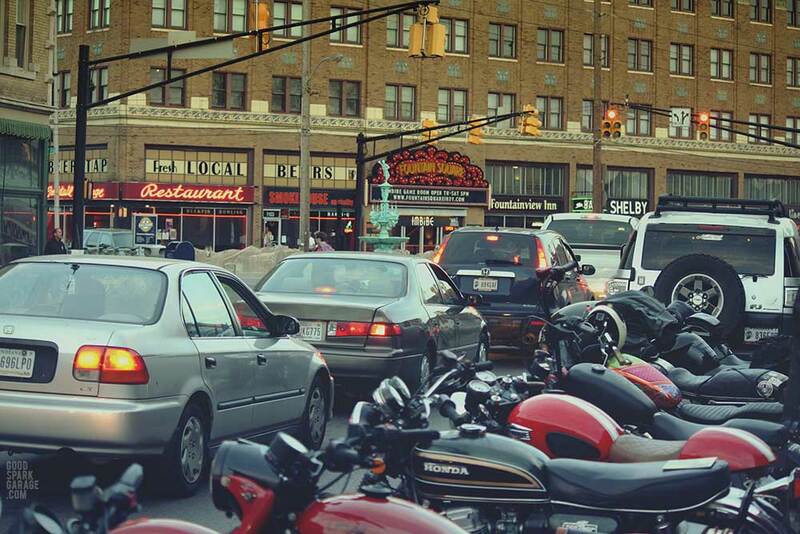 Bikes line the busy Virginia Avenue in Fountain Square with a view of the old theater. 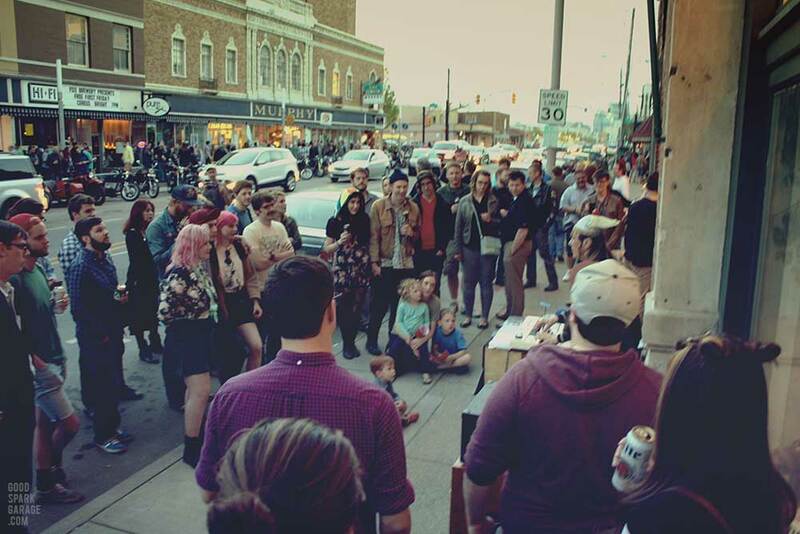 The site of the Trophy Unveiling, The Hi-Fi on Virginia Ave in the Murphy Art Center. 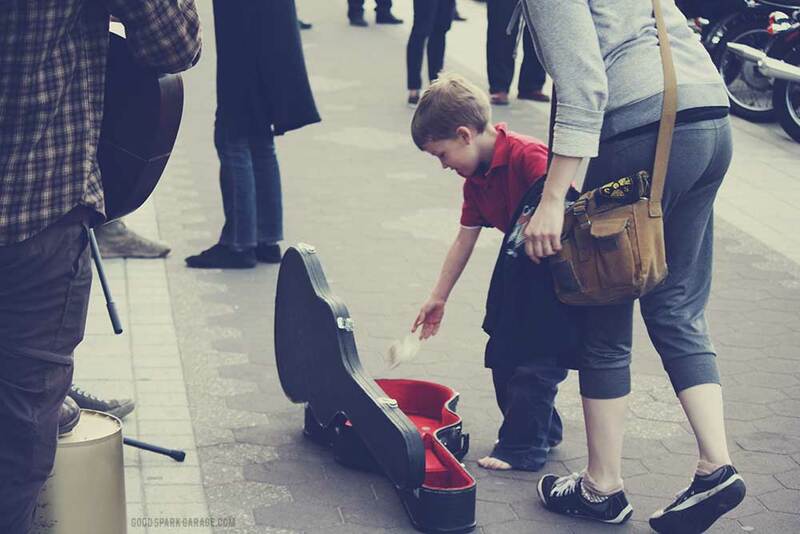 A lesson in music appreciation. 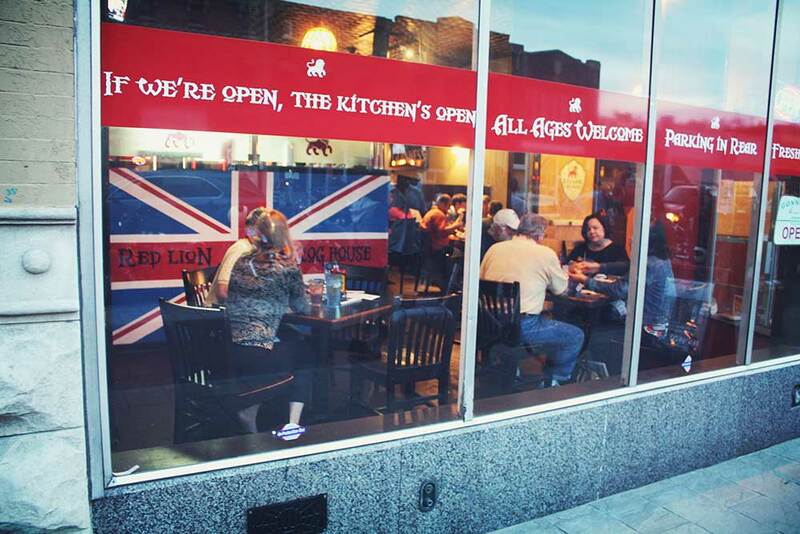 A Hopper-esque view of the Red Lion Grog House serving upscale British cuisine. 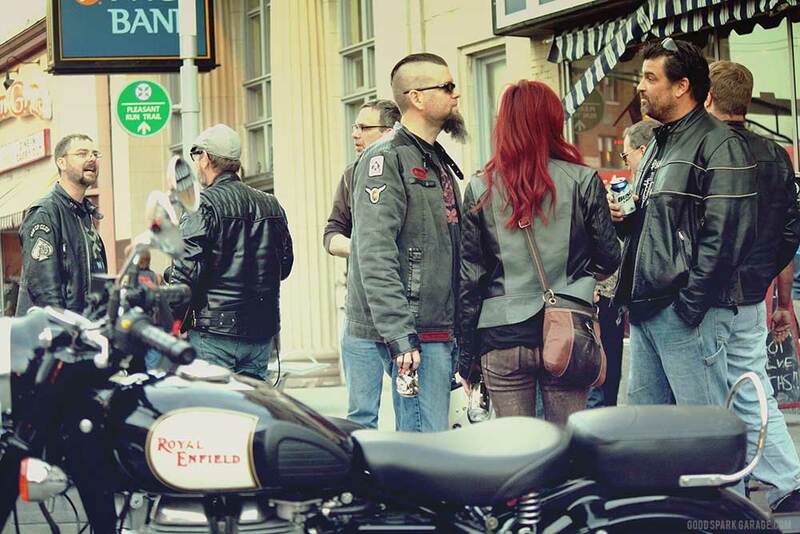 Chris Sickels (left) and Casey Wilkinson taking in the vintage sights n’ sounds. 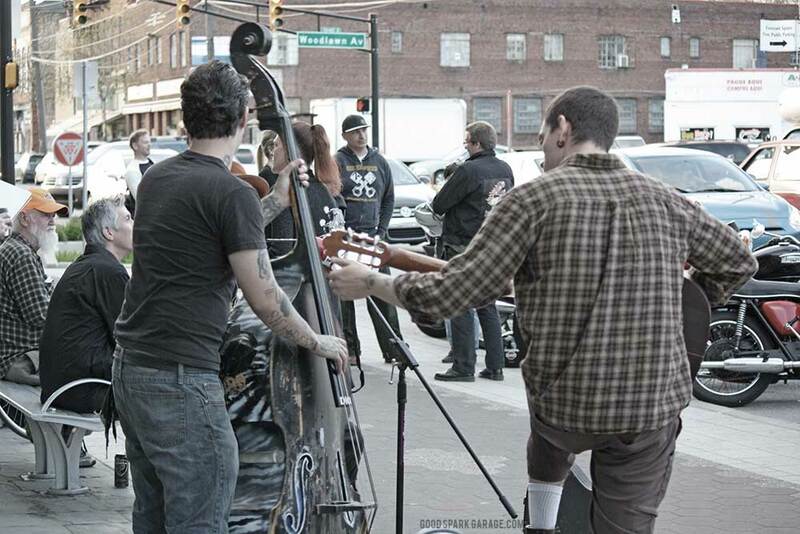 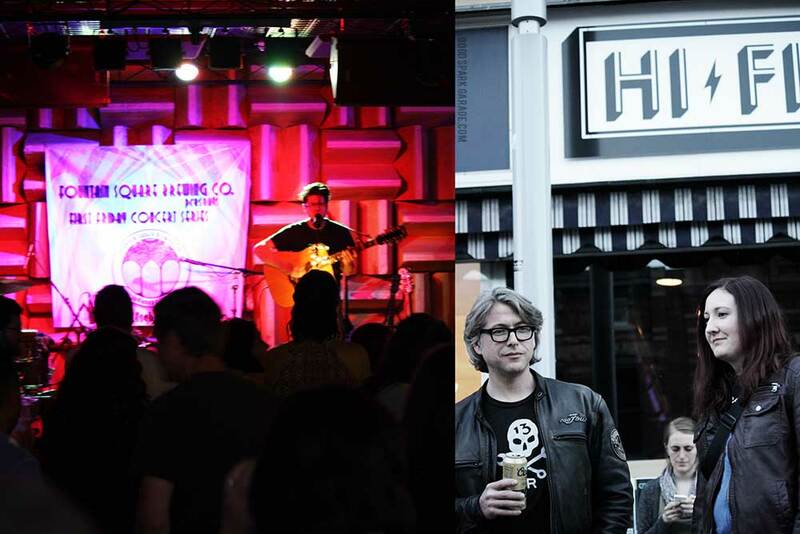 An eclectic crowd, laced with a number of Hoosier hipsters, enjoyed some interesting sidewalk entertainment. 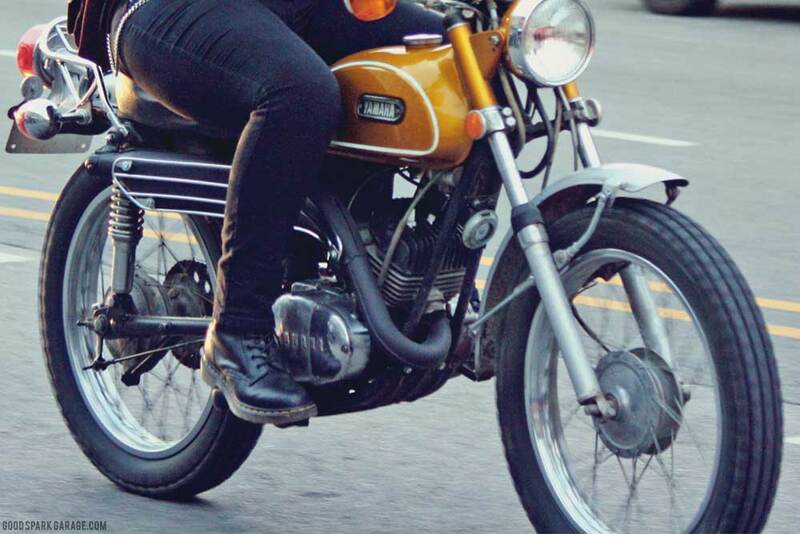 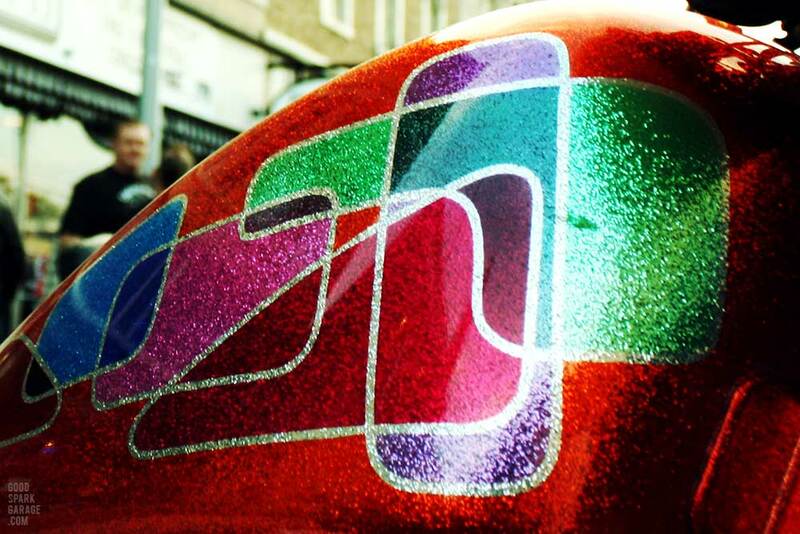 It’s not a vintage bike scene without the sound and smell of a two-stroke. 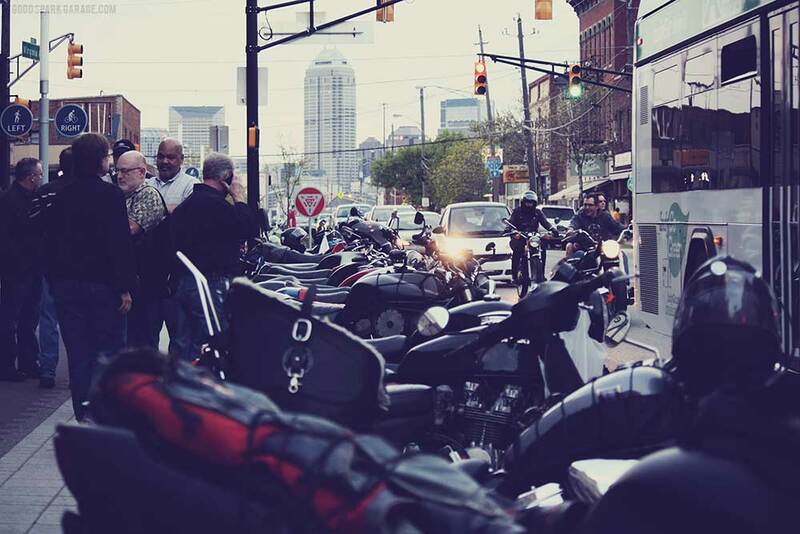 One of six Indianapolis Cultural Districts, Fountain Square is going to be a great backdrop for the upcoming Rockers Reunion. 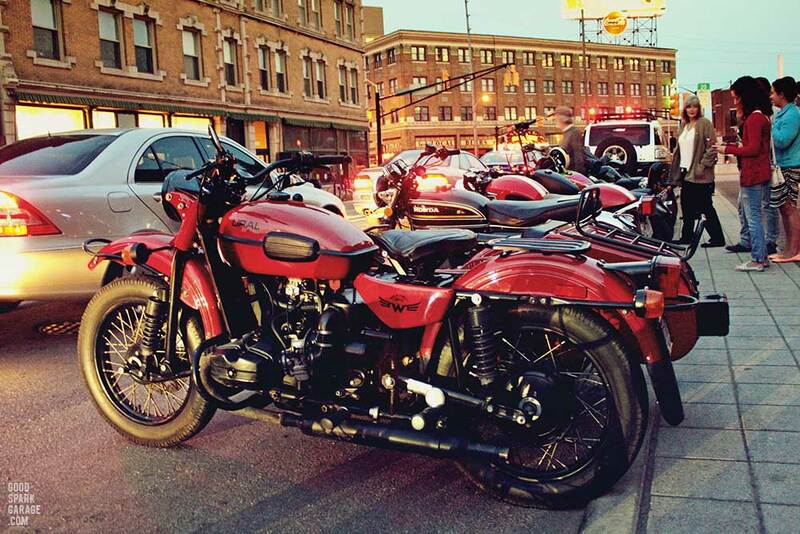 The other half of Good Spark Garage, Corey Wilkinson, brought out the Red October Ural sidecar motorcycle. 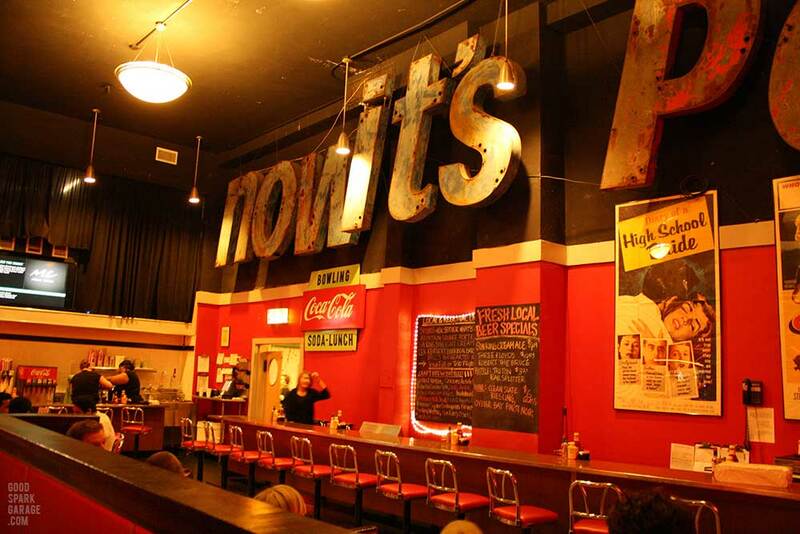 Inside the Smokehouse on Shelby, once the original diner in Fountain Square Theatre. 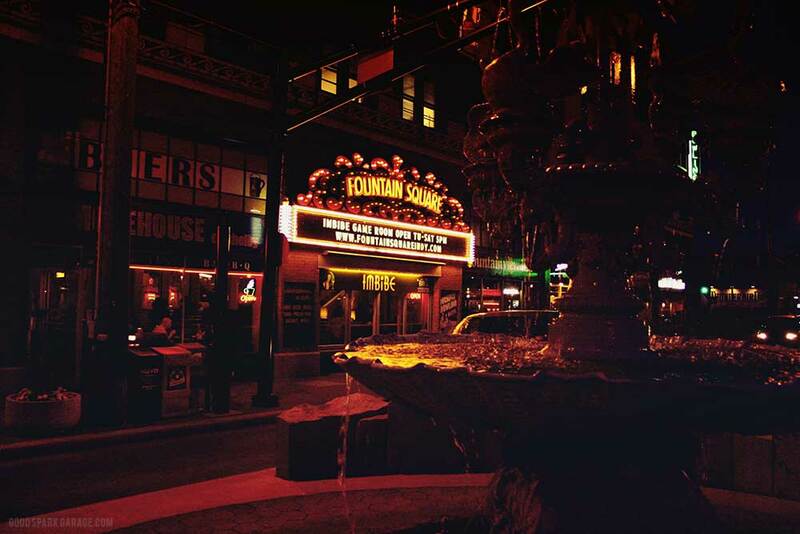 Since 1928, the Fountain Square Theatre Building at the corner of Shelby and Prospect Streets in Indy. 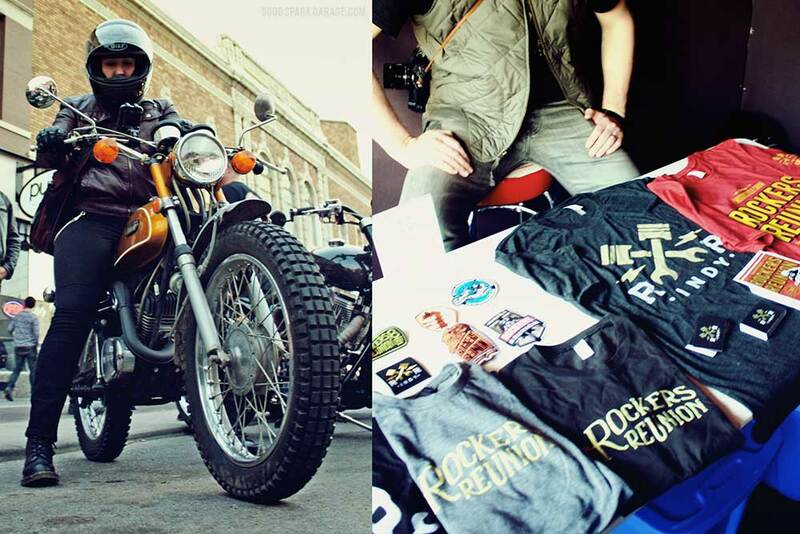 If you’re interested in seeing the happening scene of Rockers Reunion Indy or wanna win a custom trophy, shine up the ol’ steed and ride on in to Fountain Square on May 30th, 2015!